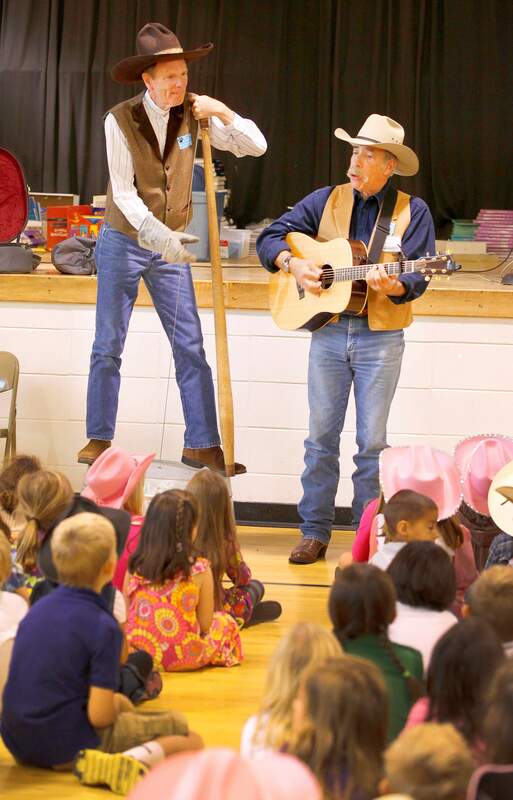 SHAUN STANLEY/Durango Herald - DURANGO - 10/04/2012- Cowboy Poet and musicans Bill Barwick and Washtub Jerry entertain students at Park elementary school Thnursday morning with tales and music as part of a community out reach program of the 24th annual Durango Cowboy Poetry Gathering that runs through Sunday in Durango. 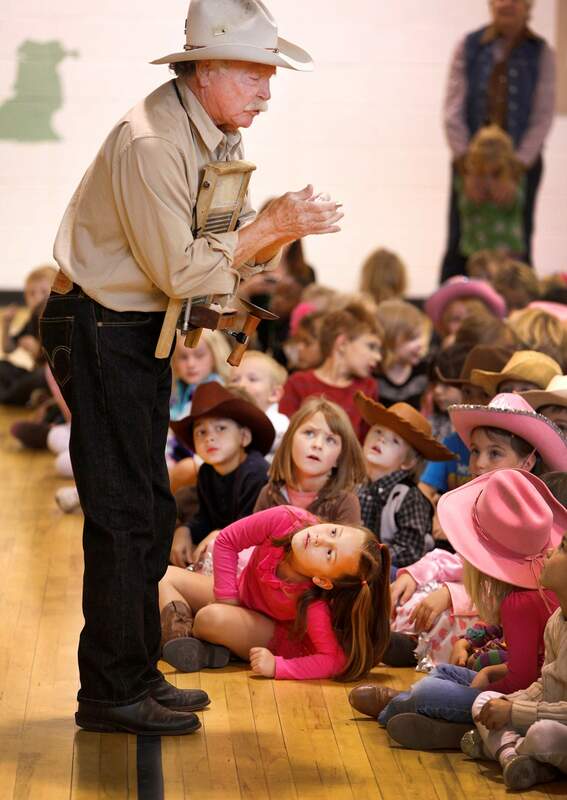 Cowboy balladeer and storyteller Otto Rosfeld captured the attention of Park Elementary students Thursday morning with his homemade prairie percussion instruments. Rosfeld traveled from Valentine, Neb., to take part in the Durango Cowboy Poetry Gathering, which runs through Sunday. 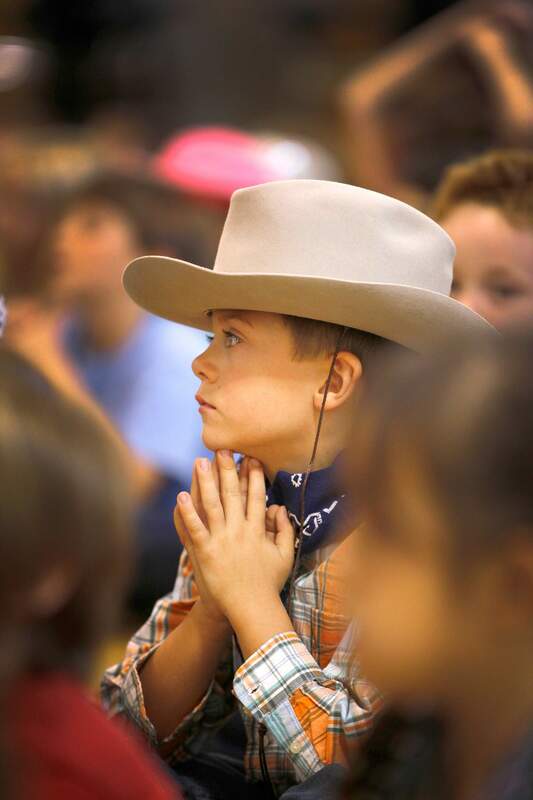 Josh Acker, a first-grader at Park Elementary School, is captivated by the cowboy poets music and stories. He came dressed for the occasion. The annual Durango Cowboy Poetry Gathering, a showcase of rustic musical and iambic talent, began Thursday, with exhibitions to continue through the weekend. No real flames are involved, but through the power of words, instruments and paintbrushes, cowboys and cowgirls will try to re-create the campfire ambience that defined rural life in decades gone by. Going strong since 1989, the gathering was originally devised after local hatmaker Kevin OFarrell visited a similar shindig in Elko, Nev., and decided Durango needed one, too. Linda Mannix, who raises Texas longhorn cattle with husband, Jeff, south of town, has helped with the gathering from the beginning and now serves as coordinator. She says artistic expression was a common way for cowboys to unwind after a long day corralling livestock or baling hay. They would sit around the fire and entertain themselves by singing and telling stories. It became an art form handed down by word-of-mouth, she said. Some performances are serious; others assume a humorous, tongue-in-cheek tone. Each is delivered in distinctive cowboy vernacular. Regardless of style, there are no imposters on stage at the gathering. All 47 performers are the real deal, Linda Mannix said. They are genuine, working cowboys. They have lived the life, she said. Several interactive events are new this year. Canadian writer Doris Daley will give a workshop Saturday morning, called West Word Ho for adults who want to coax out their inner poet. That afternoon Robert Young will illustrate how literary portrayals of Western life have changed over time, and harmonica virtuoso Gary Algretto will teach the audience how to croon those winsome melodies. Mannix said the Cowboy Poetry Gathering is intended to remind locals that long before tourism and recreation were primary economic drivers here, most families lived off the land. Until the 1980s, Colorado had more cows than humans. Performances are dispersed between the Strater, General Palmer and Rochester hotels, the Durango Arts Center and assorted galleries in town. For a complete list of times and locations, and for ticket information, visit www.durangocowboygathering.org.